Laura E. Ruberto is a professor of Humanities at Berkeley City College in the Department of Arts and Cultural studies, and Joseph Sciorra is the Director for Academic and Cultural Programs at the John D Calandra Italian American Institute at Queens College, City University of New York. 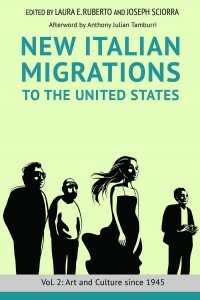 They recently answered some questions about their edited collections, New Italian Migrations to the United States Vol. 1: Politics and History since 1945 and New Italian Migrations to the United States Vol. 2: Art and Culture since 1945. Q: How did you become involved in this project and how did it develop over time? Ruberto and Sciorra: We first began talking about this collaborative project in 2008. We come from different disciplinary backgrounds – film and cultural studies (Ruberto) and folklore (Sciorra) – with a shared overlap in our work within Italian American studies. For years we had noticed that the Italian American studies scholarship we were both steeped in and contributing to as part of our respective academic careers did not match much of our own personal experiences as Italian Americans with post-World War II immigrant families. We began thinking about the connections between different periods of Italian migration and recognized the need to speak more cohesively about Italian movement to the United States in scholarship. Thus, to a great extent the impetus behind this project comes from conversations with colleagues in different disciplinary fields about the lacuna of much scholarship in acknowledging these new waves of migration. Not only were our families’ stories and those of many friends and colleagues not readily found in the academic literature, those histories were not incorporated into master narratives about and theoretical approaches to Italian migration history and culture in the United States. We issued a Call for Papers in the spring of 2009 and soon received a significant number of abstract proposals as well as other inquiries about our project. Early on we thought to include memoir and related approaches in the manuscript, but given the large number of contributors we eventually decided to feature only more conventional scholarship. The anthology was originally conceived as a single, interdisciplinary collection of articles. But the exciting and provocative essays we accepted turned out to be longer than could fit in a conventional anthology so, in cooperation with the University of Illinois Press, we moved to have two volumes, one addressing historical, sociological, and political topics, and a second volume focusing on art and culture. Q: Volume 1 focuses on history and politics since 1945 and volume 2 focuses on art and culture. Briefly, describe some of the different essays readers can find in these volumes. Ruberto and Sciorra: Two essays in volume 1 by historians Stefano Luconi and Maddalena Marinari address the ways in which players in both the United States and Italy, from governmental officials to NGOs, worked to change and otherwise undermine the restrictive U.S. immigration law, specifically the Johnson-Reed Act of 1924 and its racial quota system. The most effective of the Italian American community-based lobbying groups was the American Committee on Italian Migration which was instrumental in bringing about the Immigration and Nationality Act of 1965 that benefited more than 290,000 Italian immigrants, as well as countless immigrants from across the globe. An important change occurred with the passage of the McCarren-Walter Act of 1952, which, while it kept in place quotas, allowed women with U.S. citizenship to sponsor their Italian husbands and children as non-quota immigrants. Historian Elizabeth Zanoni’s contribution looks at the letters to an advice column in the Italian-language newspaper to understand how women negotiated their new political advantages. Three articles are effectively community studies: James S. Pasto looks at how working-class Italian immigrants integrated into the existing Italian American community of Boston’s North End; Donald Tricarico explores the second-generation youth culture of Guido in Brooklyn; and Ottorino Cappelli and Rodrigo Praino examine the transnational Italian immigrant political brokers operating in Queens who sought to influence both New York State senatorial elections and Italian parliamentary elections. Volume 2 deals specifically with culture made by and about Italian immigrants and their descendants from the end of World War II to present. Joseph Sciorra’s and Laura E. Ruberto’s respective articles deal with the media, in particular an Italian-language radio program that broadcast messages from relatives in Italy to Italian Americans in New York City, and the representation of Italian immigrant women played by the likes of Sophia Loren and Anna Magnani in Hollywood films. The rebooting of Italian American culture is made evident in Incoronata Inserra’s and Simone Cinotto’s articles about Italian immigrants who reconfigured notions of and interpretations about Italian folk music and Italian food in the United States. Folklorist John Allan Cicala considers the specifics of self-taught sculptor Silvio Barile’s biography, in particular the trauma of war and its aftermath, to situate the artist’s creative process in the realms of self-discovery, emotional healing, and place-making. Teresa Fiore examines the current literature of recent Italian immigration, and also professional Italians and their role in Italian language and Italian studies departments at U.S. universities. Both volumes are followed by afterwords penned by historian Donna Gabaccia and literary critic Anthony Julian Tamburri. 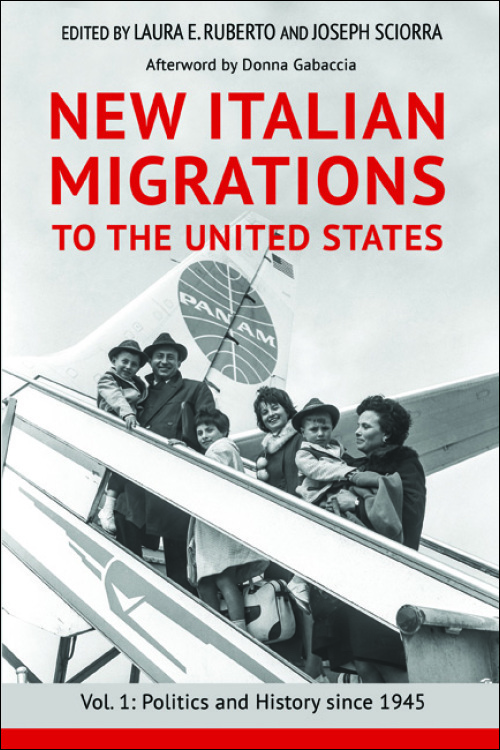 Q: How do your books differ from other studies of Italian immigrants in the U.S.? Ruberto and Sciorra: Our two volumes differ from other Italian immigration books in a fundamental way: We are proposing a radical rethinking of the historical periodization that governs standard studies of Italian migration to the United States. In other words, most research of Italian immigration to the United States takes as its starting point late-nineteenth-century immigration and stops tracking new immigration by World War II if not before. Along with that limited time frame, those studies tend to assume a linear narrative of ar­rival—acclimation—assimilation from immigrant to third generation which parallels this time frame. Our books push against such framing of the Italian migration story. Beyond the re-periodization we argue that the continual migration of Italians to the United States significantly impacted Italian American culture generally, “rebooted” it, if you will. Continual immigration helped shape an Italian ethnic culture that is dynamic and ever-changing and, at the same time, new Italian immigrants also effected social and political changes across a wide spectrum of areas. 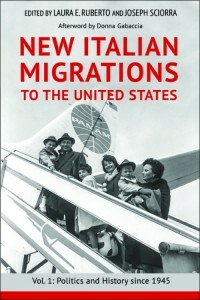 Also, by recognizing the continual immigration of Italians to the United States some of the research in our books helps highlight the role Italians and Italian Americans had in removing this country’s discriminatory quota law (that had been in effect from 1924 until 1965) and which today is being threatened once again by the current presidential administration. Q: Why is it important to think of Italy as an “emigrant nation” when discussing Italian migration to the U.S. since 1945? Ruberto and Sciorra: The history and culture of Italy is that of near-continuous emigration. From 1869 (just eight years after the establishment of the nation state) to 2005, approximately 28,500,000 Italians left the country. That’s an astonishing number of people. Working-class Italians first traveled to South American, in particular Argentina and Brazil, and then shifted to United States where over 4.5 million immigrated from the 1880s to 1924 when the restrictive Johnson-Reed immigration act was passed. Yet Italian Jews fled as exiles to this country once the Fascist government imposed the racial laws in 1938. While World War II brought a temporary cessation to Italian immigration, it started up soon after its end with refugees, war brides, orphans, and former Italian POWs who were engaged to American women. Close to half a million Italians came to the United States between 1951 and 1975. Another 171, 598 Italians have come since 1979. In recent years there has been an uptick of Italians residing in the United States without legal status; one journalist estimated in 2013 that 150,000 Italians found themselves in this precarious state. Despite this near-continuous flow of Italian immigration to the United States and the significance of immigration from 1945 to present little scholarly work has been conducted by American scholars on the time frame covered in our books. Volume 1 documents and evaluates this historical period as a way to assess more generally how ongoing European migration is related to the continual development of postmodern notions of Italian ethnicity, while volume 2 considers instead how said immigration might be understood through cultural expressivity, community engagement, artistic productions, and media representations. Q: How does the migration period from 1945 to 1973 differ from the 1974 to the 2010s period? Ruberto and Sciorra: We looked at the last seventy years of Italian immigration to the United States and began mapping out different trends within this large time span, ultimately recognizing two main groups of Italian immigrants who have arrived since 1945 in the United States—“working class” and “elite”—creating a class-based sociocultural dis­tinction that is suggestive and context-driven. Those who arrived between 1945 and 1973 we call the “working-class” group, who were mainly from southern regions, arriving often with a skill or trade and remaining in the skilled labor force in the United States and possibly entering the middle class more quickly than their pre–World War II counterparts. We captured the 1974 to the present group with the term, “elite,” who tend to arrive with college degrees in hand or with the intention of receiving them soon thereafter and can be generally understood as a more profession­ally intended migration often journalistically referred to as a “brain drain,” or fuga dei cervelli. Obviously, these are slippery terms and not everyone fits neatly into these two categories but we see them as good starting points to start to give shape to the continual migration of Italians. Q: What impact has Italian immigration from the last seventy years had on U.S. popular and consumer culture? Ruberto and Sciorra: The contributors from both volumes discuss a number of inter-related impacts from the last forty years of Italian immigration, across social, cultural, political, and consumer arenas. We make the case in the introductions to the two volumes that it was not only people that emigrated to the United States. An Italian style—first noticeable through the importation of fashion, design, food, entertainment, and other habits of everyday life–has become more and more connected to Italian-national–oriented migrants, whose perspective and identity are less locally driven. Thus, the commodities of things, and those individuals who embodied the new cultural cachet of Italy (Sophia Loren, Luciano Pavarotti, Mario Andretti, and so forth) became a kind of new immigrant as well. The new prestige of things Italian impacted the global economy and shaped Italian American identity and cultural cachet. The new exported Italian style was embodied and enacted across a multitude of products, objects, events, and individuals who crossed the Atlantic. By the end of the 1970s, the linking of more recent immigrants who fit the elite description with the general economic stability achieved by the working-class wave reinforced the cultural politics of race, further stabilizing Italian Americans as a privileged white ethnic. Two notable articles highlight the impact Italian immigrants had on media and popular culture since the end of the twentieth century till now. Simone Cinotto’s essay shows how women such as Marcella Hazan and Lidia Bastianich, who arrived in the United States without any formal training around food, became prominent figures in a global interest in Italian food and food culture. Aligning themselves with other elite immigrants of the time, the careers of such women were part of the general development in postwar decades of a fashionable and sought-after Italian culture. Donald Tricarico, on the other hand, situates Guido subculture in the sociocultural milieu of New York City and in particular Bensonhurst, Brooklyn, where many postwar Italian immigrants settled. These once-local social formations reverberated as media representations on the internet and ultimately on the MTV show Jersey Shore, thus contributing to the reformulation of white ethnic identity as a result of postwar Italian immigration. Q: What directions do you see for future scholarship? Ruberto and Sciorra: We hope our volumes will spark new and continued interest in the stories, histories, and culture by and about Italian immigrants to the United States in the last seventy years. For instance, we hope to see more scholarship around the role Italian immigrants had on changing notions of race and the social dynamics within both urban and suburban communities in the 1960s and 1970s and at the same time more work could be done to understand the role Italian immigration played in the restructuring of the U.S. immigration laws in the 1950s and 1960s. We would also love to see oral histories conducted with now aging post-World War II Italian immigrants so their experiences can be better documented. We also hope that future scholarship on literature and the creative arts will consider some of the themes suggested by our re-periodization. In particular, we believe it would be fruitful to consider how writers and artists who are the children of post-1945 immigrants have developed characters and themes concerning the working-class wave of Italian immigra­tion in their writing and have taken on transnational and generational con­flictual subjects in their works. Finally, given contemporary Italy’s status as a destination country for refugees and immigrants from other parts of the globe, we see in our contemporary moment a double or secondary migration happening more and more frequently—with for instance, Ghanaian Italian or Ivorian Italians immigrating to the United States to work or study. How will the narratives and identities created by these and possibly other double immigrants leaving Italy for the United States reformulate and reimagine Italian America? 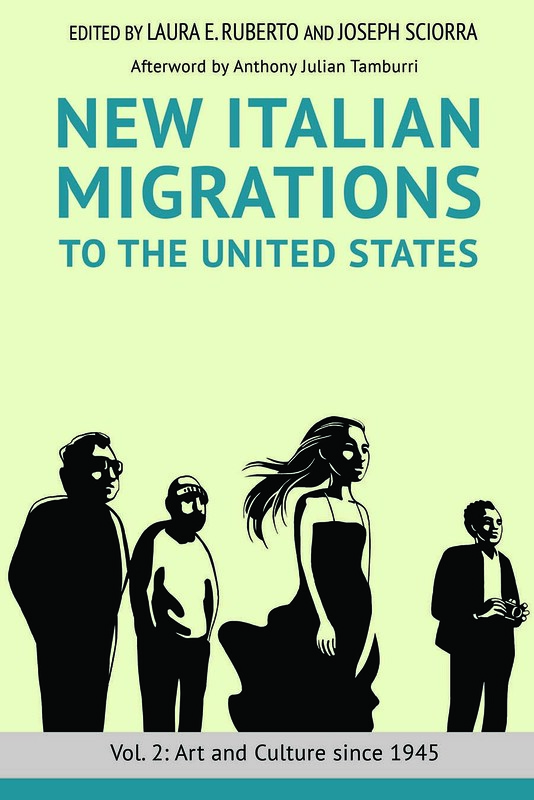 Read more in New Italian Migrations to the United States Vol. 1: Politics and History since 1945 and New Italian Migrations to the United States Vol. 2: Art and Culture since 1945, available now.